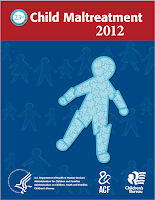 The U.S. Department of Health and Human Services’ Administration for Children and Families (ACF) released Child Maltreatment 2012, the 23rd in a series of reports designed to provide State-level data from the National Child Abuse and Neglect Data System. Child Maltreatment 2012 includes information on reports of abuse and neglect made to child protective services (CPS) agencies, the children involved in reports, types of maltreatment, CPS responses, child and caregiver risk factors, services, and perpetrators. According to the 2012 report, the number of children suffering abuse, neglect, and maltreatment dropped nationwide for the sixth consecutive year. The national estimate of unique victims for Federal fiscal year (FFY) 2012 was 686,000, compared to 723,000 in FFY 2007. While the number of abuse victims decreased, the number of fatalities attributable to child abuse and neglect appears to have increased, from 1,580 in 2011 to 1,640 in 2012.